New Raw Imprintcrunchy, electro-infused, low-fi heavy podcast by Lobster Theremin´s finest Daze . Also we are super glad to present you a podcast from no other than 50Weapon´s mainstay Addison Groove. 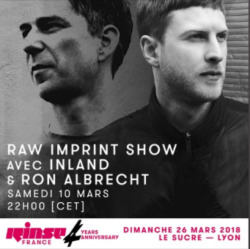 Moreover there are two new techno Sets: Ron Albrecht delivers a beautiful, banging, Dystopian like selection, while Inland shows his most powerful weapons. We hope you enjoy these journeys as much as we do!